San Francisco Giants fans celebrate their 2014 World Series victory in the Civic Center Plaza outside of city hall Friday, Oct. 31, 2014. Eric Gorman/Xpress. 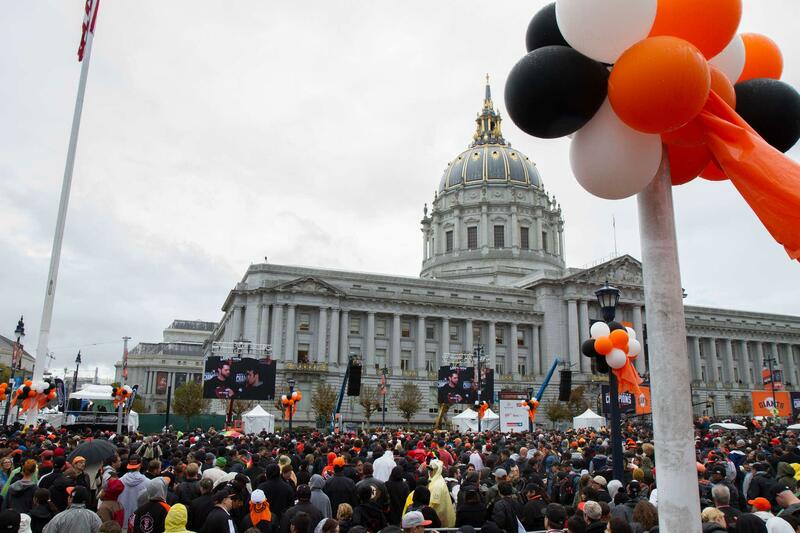 The weather let up and the crowd thickened in the afternoon, where five Jumbotrons broadcasted from beyond as the San Francisco Giants parade made its final turn behind city hall. Giants Public Address Announcer Renel Brooks-Moon opened the ceremonies before handing it off to radio play-by-play man Jon Miller, who handled player introductions. Mayor Ed Lee led off with a high-pitched “Yes! Yes! Yes!,” Larry Baer praised the team and Brian Sabean began his address by making a plea for a higher payroll. Hunter Pence poured fuel on the fire when he led his own “Yes! Yes! Yes!” chants and asked the crowd about their soon-to-be free agent third baseman Pablo Sandoval. “Re-sign Pablo?” he shouted, and the crowd roared three yeses back at him. 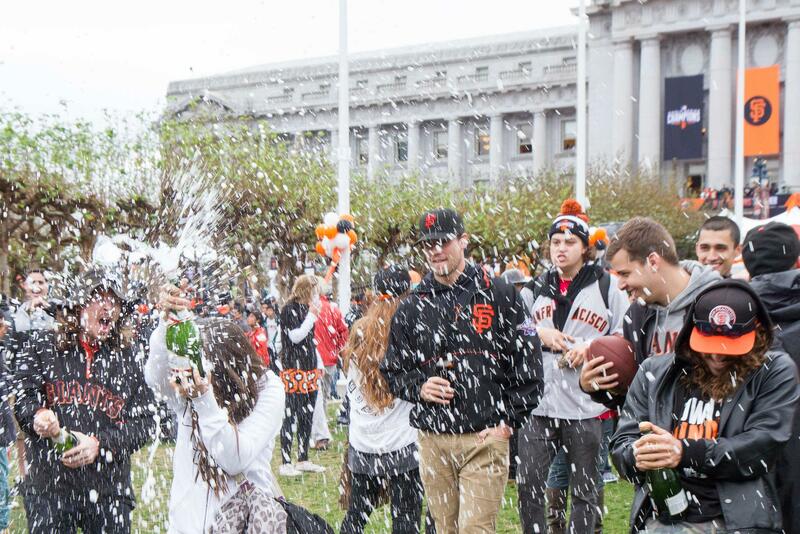 It was caffeinated speeches from beloved players like Pence and heartfelt ovations from Mike Krukow and Duane Kuiper that the soaked masses truly came to see. The long-time Giants color analyst, who recently intimated that he has a degenerative muscle disease called inclusion-body myositis, visibly limped to the stage with a cane in his right hand and his best friend on his side. Sandra Correia and her friends spray champagne in celebration of the San Francisco Giants World Series victory during the parade in the Civic Center outside of city hall Friday, October 31, 2014. Eric Gorman/Xpress. Tim Hudson reminisced on dreaming that his sixteenth year in the big leagues would end in a parade up Market Street. Veteran pitcher Ryan Vogelsong pulled the microphone from Madison Bumgarner and Buster Posey to make tribute to recently passed actor Robin Williams by shouting, “Yes indeed!” And the usually soft-spoken Posey began by calling Vogelsong weird before eyeing Pence and warning him about the rolling cameras. Both Bumgarner and Posey were met with raucous “M-V-P” chants from the sprawling Civic Center crowd. Bumgarner was brief and humble, but strong when he reiterated what has been said so many times over the last two days about his baseball team.